Brady said this year's Super Bowl was "an emotional time for all of us." (Mark J. Rebilas/USA TODAY Sports/Reuters) New England Patriots quarterback Tom Brady (12) and daughter Vivian celebrate as they are interviewed by CBS host Jim Nantz after Super Bowl LIII against the Los Angeles Rams at Mercedes-Benz Stadium in Atlanta, Feb 3, 2019. 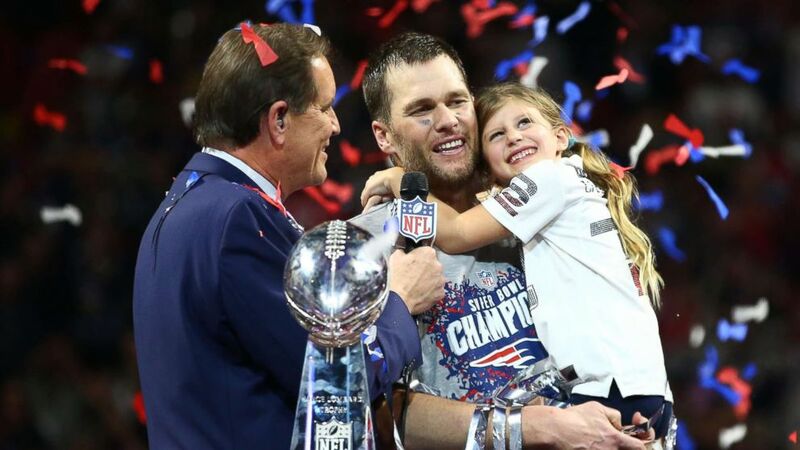 “Football success is one thing, you know, being a good dad, being a good husband, being a good friend, that's really important to me, too,” Brady added. (Kevin C. Cox/Getty Images) Tom Brady of the New England Patriots kisses his wife Gisele Bundchen after the Super Bowl LIII against the Los Angeles Rams at Mercedes-Benz Stadium on Feb. 3, 2019 in Atlanta. Brady and Bundchen will celebrate their 10th wedding anniversary later this month. Brady called his wife his "rock." Bundchen posted a photo before the Super Bowl of her hugging Brady from behind, writing, "I got your back."